planning happens behind the scenes to make every happy memory fall into place. From the rings to the cake to the romantic send off to your honeymoon, there are many phone calls, meetings, and tastings that take place to get everything arranged the way you want it. And while your wedding day may have been meaningful and a celebration of the love that the two of you have, if you thought about it really hard, would you do anything different? Think about it: Something is always bound to go wrong at a wedding or it may not have been the way you completely envisioned it. Wedding trends can also change pretty quickly, and if you’re looking back at your wedding photos you may wish that you had chosen a different dress, cake, or style of venue. Dana Rebecca Designs surveyed 2,000 people who were married in or after 2010 to ask what they would change about their wedding if they had a chance. Are they fairly satisfied with what they chose, or would they completely redo everything if they could go back in time? First, we wanted to get an idea of what our participants’ wedding days looked like and asked them questions on what the costs were as well as details about when and where they got married. Most of our survey respondents (70%) said that they spent less than $25,000 on their wedding. Just 17% of our respondents spent between $25,000 and $50,000 with 4% spending between $50,000 and $100,000 and less than 1% spending over $100,000. The biggest spenders were in the Northeast region of the country. When it came to staying on budget, 52% of our respondents said they were able to stick to their original wedding budget and 20% said they were even able to come in under budget. Surprisingly, only 28% of our respondents said that they came in over their wedding budget. The most popular season to get married was summer, with 35% of our respondents choosing to tie the knot during the warmest part of the year. Fall came in a close second (27%), followed by spring (25%), and unsurprisingly winter came in last (13%). A big portion of our respondents said their “I do’s” on Saturday (75%) with a small percentage (14%) choosing a Friday, and just 11% choosing Sunday to tie the knot. As for the type of wedding, 52% of our respondents had a hometown wedding, 28% had local and out-of-town guests, and 20% had a destination wedding. 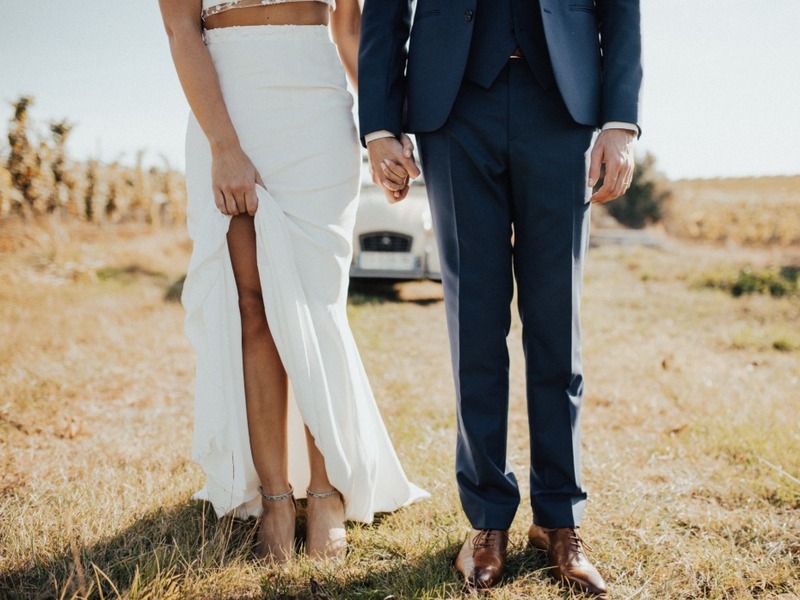 And it turns out that many of our survey respondents preferred a smaller wedding, with 41% inviting less than 50 guests, 31% inviting between 50 and 100 guests, 21% inviting between 100 and 200 guests, and only 7% opting for a large wedding and inviting over 200 guests. So, who made all of these little decisions throughout the wedding planning process? Most of our participants (58%) said that they personally made all of the wedding decisions, with women three times more likely to indicate that on the survey. Only 32% of our respondents said their partner made most of the wedding planning decisions and 10% said their parents were in charge of wedding plans. Finally, when it came to influence on the wedding decisions, a partner was the biggest influence (35%), followed by family (27%), research (25%), and friends coming in last place (13%). Many of our respondents drew inspiration from the popular social media site Pinterest (39%), digital magazines (32%), blogs (10%), and Facebook (9%). A whopping 76% of our respondents said that there were things about their wedding that they would have done differently (with our female respondents 21% more likely to say that yes, they wished they would have done something differently), and 43% said that there were things that they flat out regretted. We wanted to dig deeper into these numbers and asked our respondents a series of questions to reveal what exactly it was that they regretted. Most of them (47%) said that the thing they regretted most was that they should have enjoyed it more, 28% said that they regretted the amount of money they spent, 20% said they had some sort of regrets about their guests (yikes! ), and 19% said that they should have just eloped. However, even though these brides and grooms had their regrets, 90% said that the good outweighed the bad. So, what did these respondents specifically wish they had done differently? When it came to budgeting, our brides and grooms indicated they wished they had spent more on the honeymoon, rings, and a photographer. They also wished they had spent less on their dress and invitations. Our respondents also had some regrets about the wedding budget in general, with 50% saying they wished they had saved their wedding budget on money for the future, 26% saying they wished they had put the money toward the honeymoon, and 9% saying they wanted to spend the money in some other way. Just 15% said there was nothing they wanted to spend less on. Besides the wedding budget, our respondents had some specific regrets about their guest list, with 41% saying they should have invited more people, 41% saying they should have invited less people, and 18% saying they should have invited different people. Many of our respondents (58%) also said that they were stressed on their wedding day. However, thankfully 58% of our respondents also said that they were still able to enjoy their wedding. Finally, we asked our respondents, “Would you truly describe your wedding day as one of the best days of your life?” Luckily, 72% of our survey said that, yes, they thought their wedding day was one of the best days of their life (with men 13% more likely to say yes to that question), and only 28% said no. Overall, it seems like our respondents had some minor regrets about their wedding but still were happy with many of their decisions when tying the knot. Be sure to take a look at some real weddings that are hot off the press.